A 21 day tour visiting the major attractions of both the North and South Islands, with a whole range of exciting activities included. In the south, you’ll jet boat on the Dart River, helihike on the glaciers and take the marvellous TranzAlpine scenic train from the West Coast to Christchurch. In the North Island there’s culture to be experienced at Te Puia and fun to be found at Hobbiton Village. With great self-contained accommodation included you can bring the whole family on this adventure. Step back in time where to when pilots were larger than life, and heroes to all those who lifted their eyes skyward to the sound of an old tiger moth flying overhead. Take a scenic flight around Wanaka in a Vintage Aircraft and experience the excitement of the early flyers and their flying machines; the smell of oil and aviation fuel, combined with the aroma of fresh leather. As you don the old-style leather flying helmet, complete with flying goggles and silk scarf, experience the anticipation of being taken back in time to the nostalgia of this by-gone era. The exhilaration of the open cockpit and the wind in your face – discover the freedom and romance of a vintage scenic flight from Wanaka, one of the most spectacular scenic locations in New Zealand. This 20 minute scenic flight takes you over the township of Wanaka, including Lake Wanaka, Lake Hawea and surrounding areas. This flight takes in some of the most stunning scenery in the South Island with the backdrop of Mt Aspiring National Park and the Southern Alps. Lakeshore Spings offers exclusive luxury apartment accommodation on the shores of Lake Wanaka. Superbly appointed with lake and mountain views this is the ideal base for your Wanaka escape. Check in and out is at The Moorings Motel reception, 17 Lakeside Drive. Begin with a 30 minute scenic flight encompassing views of glaciers, Mt Aspiring, remote waterfalls, river valleys and mountain ranges that few people get to experience. With a window seat for every passenger the views are spectacular. From your landing point at Makarora, you are driven a short distance to the beginning of your 2 hour wilderness walk. The walk is on a well formed track through native beech forest which leads you to cross the first of 4 swing bridges and the clear and pure waters of the 'Blue Pools' - pristine, beautiful pools in the Blue River to linger at and enjoy while spotting fish. From here the track winds through native forest amongst the mountains of the Southern Alps near the banks of the Makarora River. Interesting and picturesque this is a very ancient setting only recently made easily accessible. The natural surroundings and tranquility are most noticeable during your relaxing walk in this special part of the Mt Aspiring World Heritage National Park. The track leads you to the meeting point at the mouth of the Young River where the jet boat will be waiting to whisk you off on a 1 hour scenic and spectacular journey through the Makarora Valley on the glacially fed waters of the pristine Makarora River. Feel the wind in your hair during your jet boat safari and be intrigued by the changing landscape as you journey to the mouth of the Makarora River and the head waters of Lake Wanaka before returning to Makarora Village. Aspen Court Franz Josef is set amongst native bush providing a very peaceful ambience. Internally the motel units are large, practical and modern with all containing quality furnishings and fittings. Terra Vive offers luxury apartment accommodation complex in the heart of Christchurch City. Situated in a prominent central city location on the grand Bealey Avenue it is within walking distance of the Christchurch city centre, casino and vibrant cafes and shops of trendy Victoria Street. Heading north from Kaikoura, the road hugs the shore for approximately 50 kilometres and offers many opportunities to view the native wildlife such as seabirds and New Zealand fur seals. One of the best seal watching locations is Ohau Point (25km north of Kaikoura), where you can observe the adults on the shoreline and the pups frolicking in the waterfall, just a short walk from the road (signposted). As you drive you will have turquoise waters of the South Pacific Ocean to your east and to the west the towering Kaikoura Ranges. Crossing the dry hills of the Marlborough ranges you head towards Marlborough, New Zealand's largest wine producing region. Blenheim sits right at the heart of Marlborough and is ideally located to enjoy an afternoon sampling the local produce. A great way to do this is to take a guided wine tour with Sounds Connection Wine Tours. Located right across the road from picturesque Seymour Square, the Lugano Motor Lodge welcomes you to their outstanding motel located in the heart of Blenheim within walking distance of many great cafés and restaurants. Enjoy the use of golf club sets, mountain bikes, daily newspaper and the DVD library. Take a short drive to the small port of Picton where the interislander ferry connects with Wellington. A bustling seaside destination, Picton is well equipped with shops, cafes - and is also the starting point for the famous Queen Charlotte Walk. 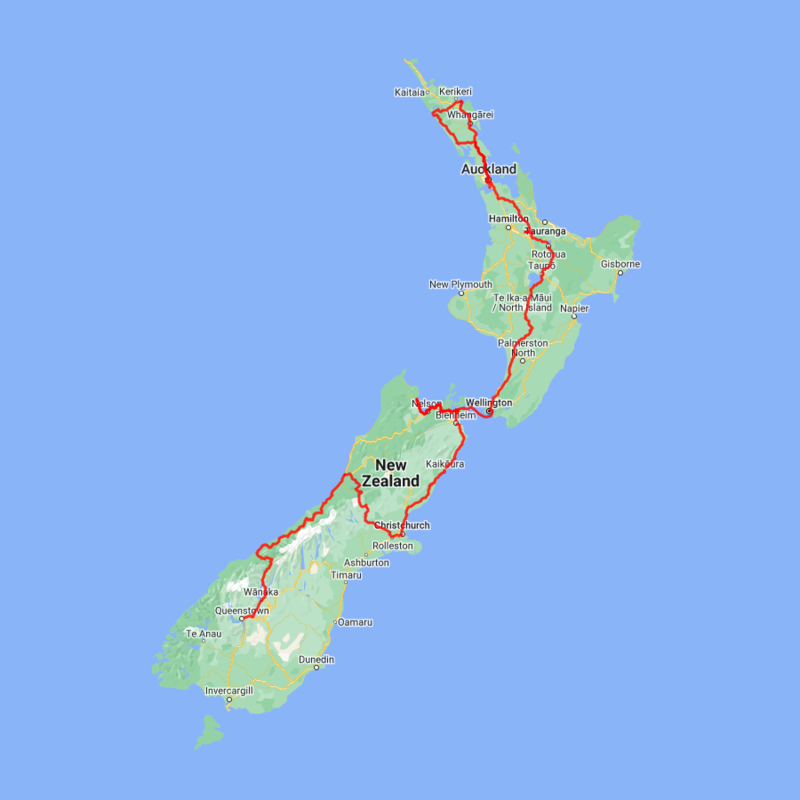 You’ll travel along Queen Charlotte Drive, traversing the length of the Marlborough Sounds coastline. Magnificent views are abundant - so be sure to make time to stop and enjoy the scenery as you go. Continue through the small port town of Havelock, home to a variety of cafes and restaurants. The highway between Nelson and Picton crosses the pelorus river, and at this junction you’ll find the famous pelorus bridge. From here there are a number of forest walks - the most popular - a 30 minute loop through beech, rimu, and totara forest. Traverse Tasman Bay passing through Motueka to arrive on the outskirts of Abel Tasman National Park. The Ocean View Chalets are situated on a 50-acre farmlet, slightly elevated and nestled along the bush line with panoramic sea views. Great access the National Park and close to the friendly Marahau village. Abel Tasman National Park, known for its coastal hiking track has an abundance of golden beaches, inlets and private lagoons. The park has a mild climate and is a special place to visit at any time of the year. Enjoy a scenic cruise through the sounds or take a kayaking tour around it’s many sheltered bays. Enjoy the melodious birdsong and get up close to some of the park’s many animal residents, including native bats, geckos, birds and marine mammals - fur seals and dolphins. Combining the best of the Abel Tasman, this trip showcases incredible beaches, coastal walks and native wildlife. First you'll meet your guide and join the 9.30am Vista Cruise along the magnificent coastline to Torrent Bay. You'll then arrive at Torrent Bay Lodge and complete a full training session and safety briefing before moving on to the water in kayaks to discover beautiful beaches, tidal estuaries and rivers. Stop for a picnic lunch in a sheltered cove and take some time to swim, explore or sunbathe on the sand. On your return trip, if the winds are favourable, sails will be hoisted and you'll sail back via Pinnacle Island to view the seal colony there - if you're lucky, you may even see some resident blue penguins at the same time. Arriving back at Torrent Bay Lodge, freshen up with a hot shower and re-join the vista cruise back to Kaiteriteri, arriving at 4.10 pm. During the summer there is the option to enjoy an unguided two hour coastal bush walk after the kayaking trip. Walk around the picturesque Torrent Bay Lagoon - via Cleopatra's Pool - to anchorage where you will re-join the boat back to Kaiteriteri. 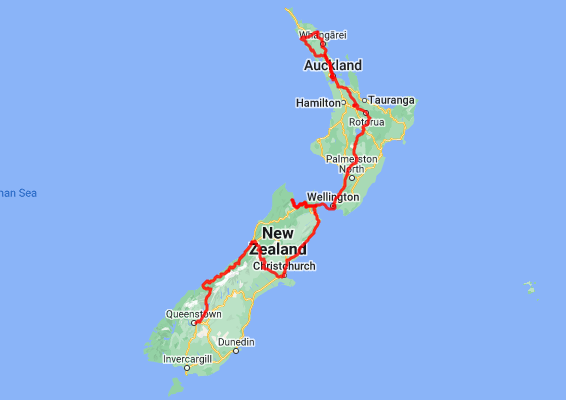 The drive takes you through the city of Nelson and along the coast of Tasman Bay towards the Bryant Range. The highway between Nelson and Picton also crosses the Pelorus River and just at this junction is the famous and historic Pelorus Bridge. From here there are a number of forest walks with the most popular the 30 minute loop through beech, rimu and totara forest to the swing-bridge. Starting in the town of Havelock the Queen Charlotte Drive travels the Marlborough Sounds coastline towards the port town of Picton. Magnificent views of the sounds can be had from many vantage points so allow plenty of time to enjoy the scenery. If you can spare the time take the narrow windy road to Portage along Mahau Sound and Kenepuru Sound with their bush clad hillsides and secluded sandy coves. Picton the busy port town of Picton, and its here from that the Interislander ferries arrive and depart. The small town centre has plenty of shops and cafes and the waterfront area is a very pleasant place to spend a few hours watching the activity of the ships. The Edwin Fox Maritime Centre on the wharf is worth a visit with the star attraction being the vessel the Edwin Fox, reputably the 9th oldest ship in the world. City Life Wellington is a suite style hotel. rooms have every amenity required for a comfortable stay and the location is superb to explore the compact city centre. Only a short hop from the Rotorua township you'll find Te Puia, known as New Zealand's living Māori cultural experience. Sprawling across 60 hectares of volcanic land, it's home to the world-renowned Pohutu Geyser, a live kiwi enclosure and more than 500 geothermal wonders. Shrouded in a continuous haze of steam, Te Puia has a dramatic and ethereal air. As you're guided along the wooden walkways, thermal springs and boiling mud pools surround you on either side, while native ferns and flax can be seen in the forest ahead. Te Puia takes pride in keeping Māori traditions and craft alive and it is home to the New Zealand National Carving and Weaving Schools. You'll have the chance to watch these unique craftspeople working as they share their skills with the next generation. Leave the steaming vents and boiling pools of the geothermal region behind as you make your way through the lush dairy pastures of the Waikato. Take in the emerald green landscapes most famous for their role in the Lord of the Rings and Hobbit films. Arrive into the small town of Matamata, for a visit to the fully intact set of Hobbiton. Experience the Bay of Islands the old-fashioned way with a cruise on the R. Tucker Thompson, a traditional gaff-rigged schooner with her own unique history. On the Full Day Sail, be as active as you like – take the helm, help set the sails, ride the bowsprit and climb the rigging – or simply relax while the crew command this impressive ship as she sails across the Bay. During your sail, the crew will share some of the rich history of the area with you. Step ashore and explore a secluded island or take a swim while your barbeque lunch is prepared. About the R. Tucker Thompson - Built from 1970-1985, the R. Tucker Thompson’s design is based on the halibut schooners of the North West American coast. With a lofty rig of varnished oregon spars, Kwila decks and bulwarks and brasswork features, she looks the part of a 19th century working ship: purposeful and square-shouldered, but fast enough to out-run the law!